BREAKING NEWS: Live from the Sony 2010 product launch | What Hi-Fi? Just getting all the pictures together for a nice big blog with images of all the new Sony kit, plus tech specs and UK prices. Will be online later this afternoon. Breaking for lunch now, and off to do a bit of filming with our handy Flipcam. More details to follow this afternoon, so keep checking the site for updates. More TVs announced: the design-oriented NX range, all with built-in wi-fi, will include the 40in NX703 model at £1400. That price includes an optional stand that allows you to tilt the TV back by six degrees. The NX703 and NX803 (price to be confirmed) will be available in March/April. And the entry-level 3D-Ready TVs will kick off with the HX803 edge-lit LED 40in at £1400. There's a 46in too. The flagship 40in HX903 200Hz full backlit LED has local dimming. Price to be confirmed. Top-of-the-range Full 3D LX903 40in will cost £2000, 60in £3500. It even has facial recognition technology that can tell if a child's getting too close to the screen and if they do, it shuts down! All 3D-Ready and Full 3D sets are due on sale in June. Sony BDP-S370 Blu-ray player due out in March for £180. Supports SACD over HDMI, and will also handle DiVX and DiVX HD. The midrange BDP-S570 model arrives end of May for £230, and the flagship BDP-S770 with 3D playback comes out in September for £299. Only the BDP-S770 has multichannel analogue outputs. As we reported earlier this week, all Sony's 2010 Blu-ray home cinema systems will be 3D-ready. Entry-level BDV-E370 out in March for £500. The 3D software update will be available from June. Right, here comes the 2010 Bravia TV line-up: EX403 models start at £550, EX503 at £700. EX43B TV with integrated Blu-ray player is £800 for a 32in model, due out in May. There's a 40in version too. The EX703 edge-lit LED TV with 100Hz motion processing will cost £900 for a 32in up to £2000 for 60in. Next up AV amplifiers. The Sony STR-DH1010 receiver replaces the STR-DA2400ES and will cost £499. Also new is the STR-DH610 at £299. Due on sale in June and May respectively. Both feature 3D pass-through. Scheduled for June launch is the £399 HT-AS5 home cinema system with 3D pass-through and three HDMI inputs. But there's no built-in Blu-ray or DVD player. Sony's 3D TV glasses won't work with other manufacturers' sets, only its own. Likely to cost around £100 a pair. Sony 3D TVs will be sold with two sets of 3D glasses as standard: you'll have to fork out for extra ones for the rest of the family. Now on to 3D TV, using active shutter technology. Just watched some 3D games trailers. Almost got hit by a bullet! OK, we're off, the official presentation has begun. We're watching a demo of Bravia Internet Video, streaming high-definition content for LoveFilm on demand. The service will be available on Blu-ray players and Freeview HD TVs. The TVs and Blu-ray players will sync with your LoveFilm account. Buffering takes around 10 seconds. Sony's 2010 Blu-ray players will come with BBC iPlayer. Coming to Sony TVs at a later date. As expected, the company has big plans for 3D TV and Freeview HD. We've flown up to Gleneagles in Scotland for today's Sony UK 2010 product launch. We're hoping to see all the brand-new Bravia TVs, including 3D and Freeview HD models, as well as Sony's forthcoming Blu-ray player range and Blu-ray home cinema in a box systems. Our first glimpse of the Sony 2010 range came at CES in Las Vegas last month. We're hoping to get details today of all the UK models and prices, so will be updating you here on whathifi.com throughout the day. 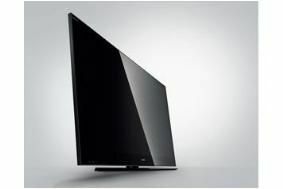 For an idea of what's in store, take a look at our CES 2010 Sony blog and our recent news stories.